Last April I was in Stockholm with my girlfriend Line to prepare our moving from Copenhagen / moving in to Stockholm. We visited several apartments in and around Stockholm and a small house on the island of Värmdö. We liked none of what we visited so the search continues. An important goal of that week in Stockholm was to find a sailboat. In 2010 I bought a Magnific Midget, a small sailing boat of 7 meters which allowed me to discover the Stockholm archipelago during the summer of 2011. Everything was new at the time, I could see all the islands, all possible moorings, so many possibilities !! The Midget was perfect! With 1 meter draft, we could moor almost everywhere (the draft is the height of the submerged part of the ship). Some tourists / clients have followed me on this sailboat. Having the boat at the Bullandö marina, east of Värmdö, it was easy to navigate to Sandhamn and Möja (the North East of the archipelago). In 2012, the Magnific Midget gave way to an IF (International Folkbåt). The IF is THE yacht of 70’s-80’s. Mainly fiberglass / plastic, relatively cheap at the time and very good sailer in all wind conditions, 8 meters long and 1.2 meters draft. Mira (his little name) which was moored in Oxnö harbor on Gålö between 2012 and 2014, took me to Dalaro, Ornö, Utö and even Huvudskär. 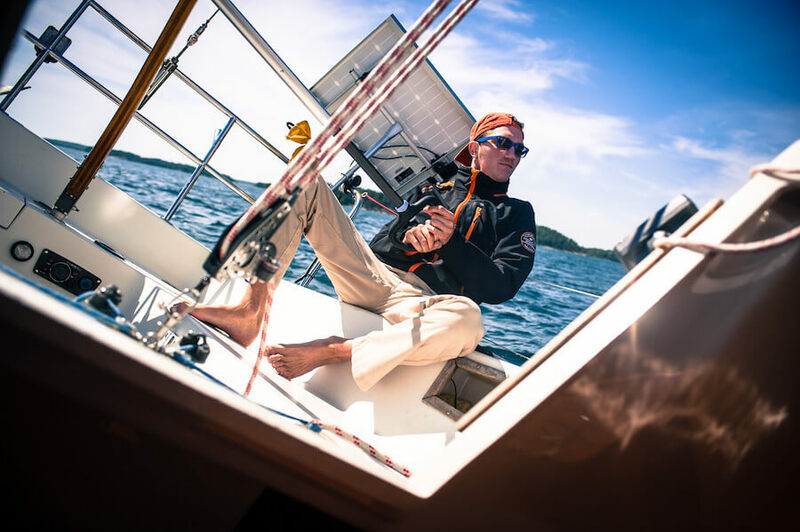 In 2013, customers – who outnumbered the previous year – all enjoyed sailing Mira. Some have accompanied me one day and some for 2 or even 3 days. They were mostly French but also Australians, English, Swiss, Belgian, Spanish and Swedish. They were delighted to discover the Stockholm archipelago from the boat, and I was happy to take care of them and see them smile at the helm of the boat. It’s not all resting to take care of people who have no experience of the sea, but with each crew it became more and more natural and I think customers felt safe under my “orders” . I use the word “order” because you must respect a discipline on a sailboat at sea. Do not think that if you come on a cruise with me it will be like in the army, on the contrary! 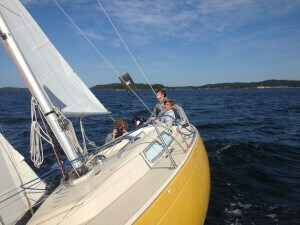 The Stockholm archipelago and sailing call for freedom. The freedom to go wherever the wind carries us and the freedom to moor on every island, every pebble. Let’s talk sailing yachts again … End 2014 I sell Mira, the 1976 IF and in April 2016 I buy a Scampi 30 – 30 as 30 feet which is equivalent to 9 meters; 1.7 meters draft; Sails of almost 50 square meters (mainsail + genoa). To read what happened between late 2014 and 2016, please read the article here. After the Midget and the IF, the Scampi gives the impression of being a “real” yacht. Indeed, it has 5 beds (1 double bunk and 3 singles), kitchen with sink, a gas cooker and fridge, a bathroom (ladies we will no longer ask you to keep it for hours (these gentlemen can do overboard)) and central heating. Also it has a real diesel engine of 12 horses which runs like clock. A solar panel powers three batteries, one is reserved for the engine ignition and 2 for the fridge, GPS, VHF … What else? The mattresses are new, the sails are only a couple of years, the rig is in very good condition. In short, this is a boat that dates from 1978 but is in impeccable condition, it is comfortable and safe.